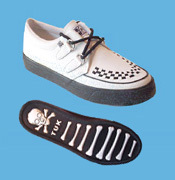 This white sports shoe is quite a mix, with the "Creeper" style upper, and a classic sports sole apperance (from above).. The perfect answer to styling vs comfort dilemma.. Wear 'em anywhere (but keep your feet on the floor at grandma's house).. White leather upper, rubber sole..